You'll notice the sermon text always begins with a list of the scriptures of the day, which are the basis for the sermon. You may find it helpful to read those passages before delving into the sermon itself. Grace mercy and peace from the one who is, who was, and who is to come…. I was asked by an Episcopal friend and colleague recently: Do Lutherans believe this verse? He knew how Martin Luther wasn’t a big fan of the book of James and went so far as to suggest it should be tossed out of the canon. He knew that our Lutheran theology and identity is grounded in the good news that by grace we have been saved through faith, and this is not our own doing, it is not because of our good works, but is the gift of God. 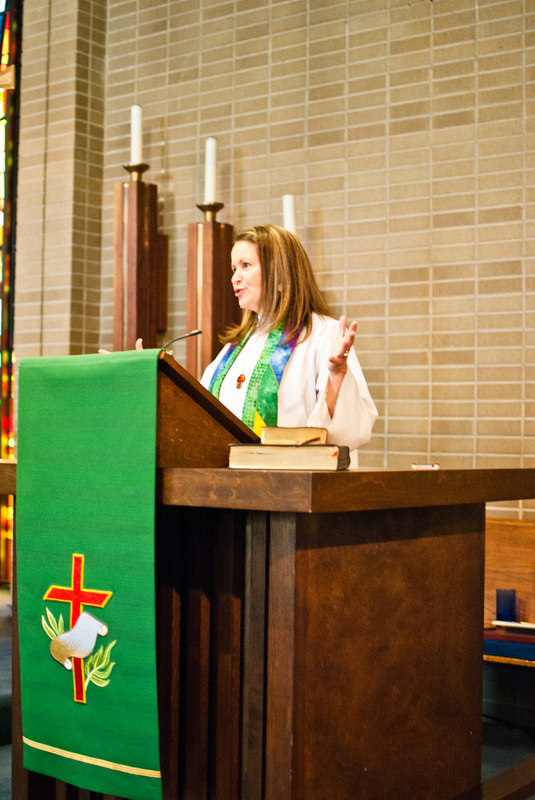 So what do Lutherans think, then, about the verse that comes to us today? It looks like we’re willing to read it in worship, at the very least. Well, I told my friend that I’m a Lutheran who believes it. Because I think it challenges us to consider what brings faith to life. If we had simply gathered here for coffee every Sunday morning over the last 10 years and acknowledged to each other that, yes, we are still Christians before heading out the door… well, sure, Jesus would still love us, of course, but… how alive would our faith be? So one of the things I’m happy to say about our years together is that they have been full of life! We dove into the deep end of the pool, asking ourselves what it would mean to be church in this moment, in this place and neighborhood? Where were we called? We’ve gone all kinds of places together. We’ve had successes. We’ve had failures. We’ve had joy in communion with one another. We’ve had conflict as we took on difficult and complex ministry tasks and ideas. We’ve taken risks and gotten creative. We have trusted God and we’ve been scared. We’ve had healing and growing and all that goes with it when you really dive in and go for it. It is so much better to step out boldly in faith even if you sometimes fall on your face or make the wrong choice than to never step out in faith at all. This is what Luther meant when he shared his own famous line: Sin boldly! Go for it, people of God! Go for it. If we really believe God’s got us, that the Holy Spirit is right here as our Advocate and we are in God’s hands, then you go for it. Live out this faith of yours. And so we have. And God has been faithful. And I shall always be grateful. Because the good news, being good news and all, will always compel us, always send us out into the world to share the good news with others, to love others as we have been loved, to serve others as we have been served. This has always been and shall always be the pattern of the Christian faith. Free gift given = Forgiveness. New life. Never-failing love and presence. Eternal identity. Children of God = Respond in faith and love as the free people you are. This is the pattern of death and resurrection. And it just keeps going. The promise is that new life will always come. So let us be thankful for sinning boldly together for the last 10 years. I hope your faith has been challenged. I hope you have wrestled with it. I hope diving into the works given to us to do has brought life to your faith – and even more faith to your life. I have certainly grown. You have challenged me and pushed me to become a better pastor. You have challenged me to know myself better and both be true to myself and faithful to my call. I shall always be in your debt. Because being challenged often helps us get where we need to go. Just after Jesus told the Pharisees last week that they were using the law incorrectly and needed to examine their hearts and remember why the law was given to them in the first place, here we now finding Jesus acting a whole lot like those Pharisees and scribes. And preachers have been scratching their heads over this passage ever since. The Jesus we know stands with the outsider. Almost exclusively. Here is the lone exception. Not only does he not stand with her, Jesus compares the Syrophoenician woman to a dog. And yet, she isn’t intimidated or scared off. Maybe she’s used to this treatment. In any case, she continues. She demands that she is entitled to at least a little bit of God’s love, too. And without much effort at all, she seems to change Jesus’ mind. Without even getting up from the dinner table, Jesus casts the demon from her daughter back at home and sends the woman on her way. From there Jesus and the disciples continue on their way, and the next one in need of Jesus isn’t given such a hard time, even tho he is most likely a gentile just like the women, given that they are in the Gentile region of Tyre. This deaf man, also an outsider, is healed with the word Ephphatha. We hear these two stories of healing at a turning point in Jesus ministry. This passage is situated between the two feeding stories in Mark’s gospel. In chapter six, people are fed on the Jewish side of the Sea of Galilee. In chapter eight, they’ll be fed by Jesus on the Gentile side. The kingdom of heaven is about to be blown wide open and Ch 7 holds the turning point. In Christ there is neither male nor female, slave nor free, Jew or Gentile. Jesus is for all and we are ONE in Christ. So I really wonder if Jesus is making this declaration by letting the Syrophenician woman make it for him, on behalf of all gentiles just like her. The way she says it indicates her understanding. Yes, but even the dog’s get the crumbs from under the children’s table. Yes, she acknowledges, there is priority for the Jewish people, the children, chosen by God, but I am arguing for Gentile inclusion as well. Because we know the crumbs, if they come from you, shall be enough. It’s a tremendous statement of faith. It’s always the outsiders who recognize the true power of God. And then, Ephphatha. Be opened. Jesus doesn’t just heal this man. He points all of us to where he is headed, and where we are to follow. Be open! Open your hearts and minds! My new community, the kingdom of God is for ALL. Now let’s go. Let’s take that good news and go. Head ourselves for the other side of the Sea and keep going. This past week, Bishop Jim Gonia joined the council and me here and led a ritual called the “Blessing of Transition.” It was a time where affirmations and encouragements were offered. Council offered them to me. I offered to them. In the sanctuary we gave thanks for the ministries of baptism, communion, preaching, funerals, weddings, and the sending of us into the world that have happened over these last 10 years. It was a powerful moment, so I want to offer affirmation and encouragement to all of you as well. You are a precious part of God’s beloved community. You are a brave and loving part of the Body of Christ. You have made a difference to the world and especially in this neighborhood in the name of Christ. I encourage you to stay confident going forward. Sin boldly. Remember the works God has given you to do not only witness God’s love to others, they bring life to your faith as well. And don’t forget to laugh. I encourage you to laugh at yourselves and with each other as often as possible. This life of faith is way too important to be trusted to a bunch of overly serious people. So if you do find yourselves taking all this too seriously, just remember that day you made me sit under the cross fountain in the park on Stewardship Sunday and get soaked. Or the evening at the block party when Ollie Daniels stood in the middle of the parking lot and hula hooped for all of us. Or ask some of these young people to sing their favorite silly song with their favorite silly actions. Or ask one of the women to tell you about the time that Bernice Parker short-sheeted all the hotel beds at a women’s gathering. When we take ourselves too seriously, that’s when we’re most tempted to shoosh the Holy Spirit and tell her we’ve got it all under control. And you don’t want to do that! Just think of all the adventures you’d miss out on! Besides, life abundant is surely meant to include joy and laughter and gratitude – as much as we can get. I thank you, friends. You have all contributed to and enriched one of the most significant chapters in me and my family’s life. You have cared well for us. You have made me a better pastor. So I thank you. We thank you. And I will thank my God every time I think of you. For all of it, I say, one more time, Thanks be to God.